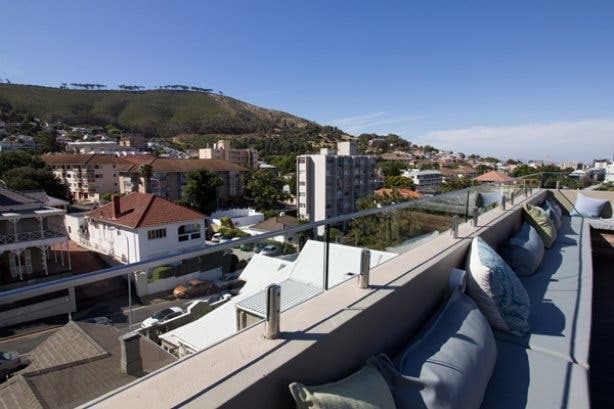 You don’t have to look too far to find a rooftop bar in Cape Town. 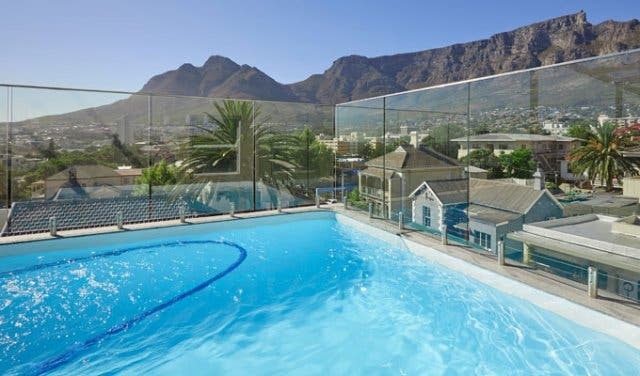 From the cityscape to the Atlantic seaboard; there are numerous sky-high perches offering glorious views of the Mother City. 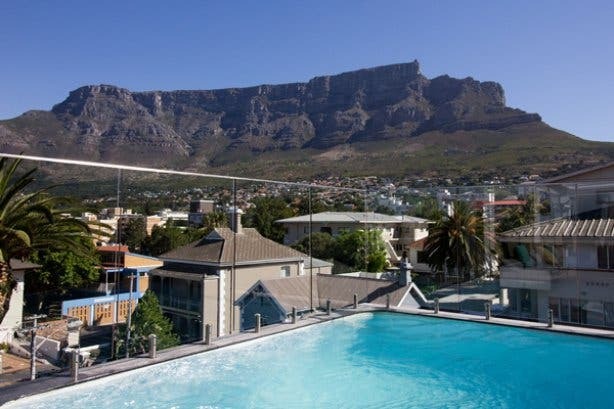 But a rooftop bar boasting an uninterrupted 360-degree view of Cape Town – now those are few and far in-between, a rarity of-sort. Located at the 52-room heritage Cloud 9 Boutique Hotel & Spa on Kloof Nek road in Tamboerskloof, this rooftop bar is open to the public – meaning you don’t have to stay at the hotel to reap the bar’s boozy rewards, cool swimming pool or magnificent sights – the Tamboerskloof institution claims a grand bar with an extensive offering and two luxurious, yet suitably relaxed, sun decks; one sporting a waterwise plunge pool (it doesn't use municipal water) and retractable roof while the other – which is accessed by a short flight of stairs – boasts endless roundabout views of the Mother City. With no buildings to hinder one’s view, to the one side visitors are rewarded with magnificent sights of Table Mountain including Devil’s Peak, Lion’s Head and Signal Hill – you can even spot the cableway doing its rounds – while the other side boasts spectacular images of the CBD and the Southern Hemisphere’s brilliant blue Atlantic in the far distance. WHAT'S A ROOFTOP BAR WITHOUT COCKTAILS? Taking a closer look at the bar; located inside and complete with bar stools and some cosy couches as well as a flat screen television (ideal for big sport matches), guests are presented with an array of must-try signature cocktails such as the Golden Dream (Cointreau, hazelnut liqueur, cream and orange juice) and the Amarula Colada (Amarula cream liqueur, white rum, coconut milk, pineapple juice) as well as the Basil Grande (freshly muddled strawberry and basil leaves, strawberry puree and cranberry juice) and Vanilla & Pear (vodka, vanilla and pear juice). In addition, the bar serves a wide selection of the Cape’s finest reds, whites and bubbly – think La Motte, Ernie Els Wines, Klein Constantia, Graham Beck Wines to name just a few – offering visitors by the glass and/or bottle options. 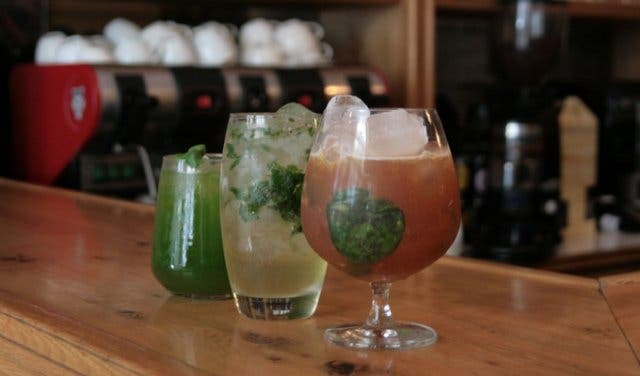 Other alcoholic options include a mix of imported beers, whisky, cognac and boozy shooters. 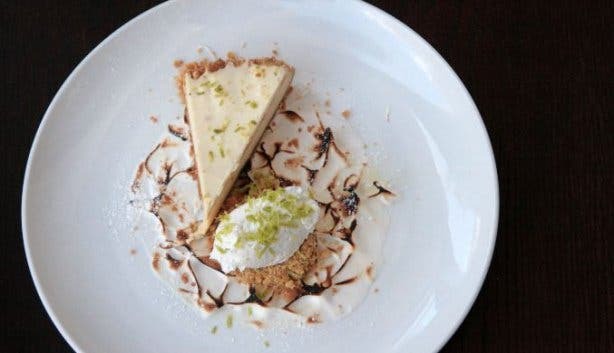 What’s more, while sipping on fruity concoctions in the pool or tumblers of spirits upstairs, visitors can tuck into a pizza from the menu, where each item on this menu is named after a local landmark. 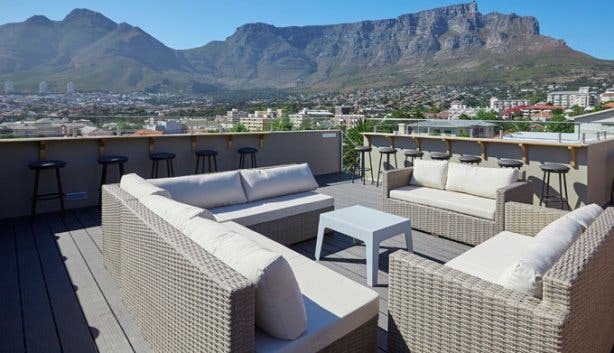 Set within walking distance of Cape Town’s lively Kloof Street and Long Street, the Cloud 9 Rooftop Bar is the ideal space for after work drinks, lavish business meetings as well as the perfect weekend sundowners spot. In actual fact, owing to its exceptional endless 360-degree view of the Mother City; the Cloud 9 Rooftop Bar is the ultimate spot for almost anything – and once you’ve seen the view, we’re pretty sure you won’t want to leave. You’ve been warned! NOTE: Cloud 9 Rooftop Bar can be booked for functions and events and offers casual seating for roughly 100 guests (excluding seats in the pool). For more information, please call the boutique hotel directly on +27 (0) 21 424 1133. 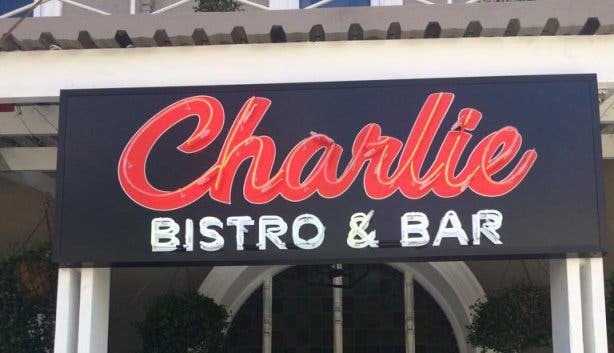 Tip: Join the Cloud 9 Rooftop Bar every Wednesday from 3pm to 7pm for its Happy Hour special: all cocktails R45 and local beers and ciders 2-for-1. The Bill: Cocktails ring in between R60 and R80 and wine (red, white and sparkling) ranges between R125 and R1 550 a bottle and between R50 and R70 a glass. Imported beers will set you back around R55, whisky and cognac R20 to R60 per shot and shooters R30. Sushi Box options range from R135 for the Classic Box (salmon roses, tuna California and avo maki) to R199 for the Rock Shrimp (tuna California laid flat and topped with Tempura prawns, Yum Yum sauce and sesame seeds). Opening Hours: Daily: 1pm until late. 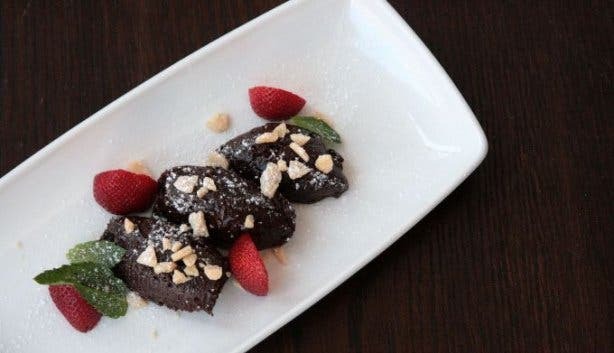 Read more about what the Cloud 9 Boutique Hotel & Spa experience entails. Or, pamper yourself with Cloud 9 Boutique Hotel & Spa’s Deluxe Laser & Spa. Take it a step further with this spa treatment and bubbly special. Make that midweek drink extraordinary with fantastic views from the rooftop bar, along with a wide selection of cocktails, wine, craft beer and spirits. 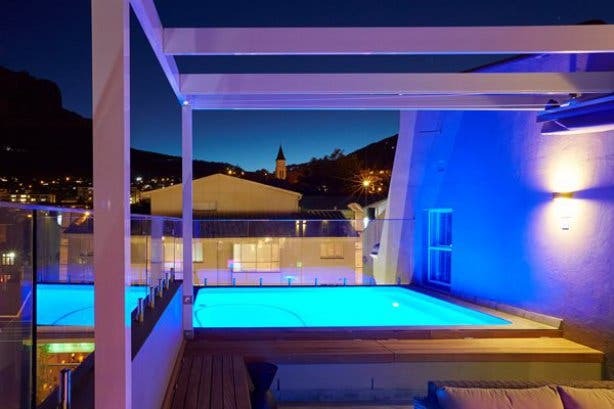 Check out Cloud 9 Boutique Hotel & Spa's 2-For-1 Happy Hour Special.